The largest cruise ship to dock in Portland Maine made her way past Portland Headlight this morning. 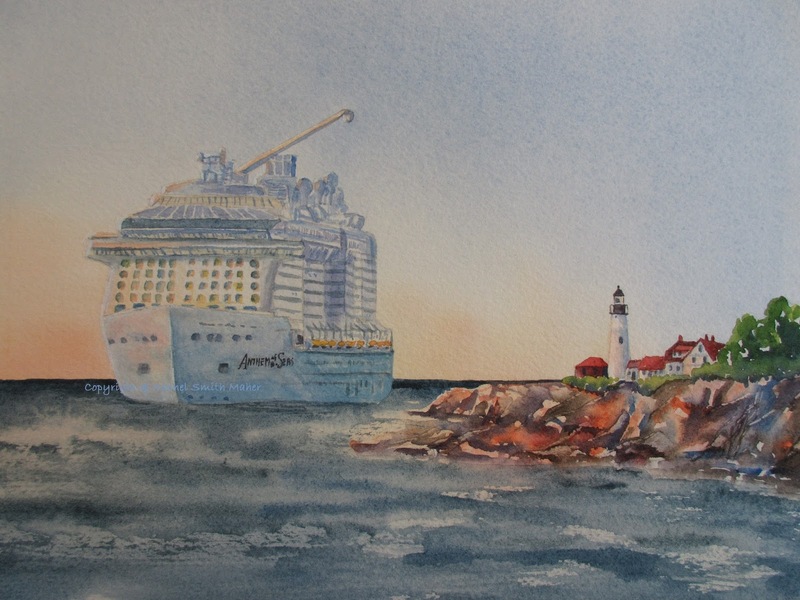 My friend, the director of Cruise Maine USA, commissioned me to capture its maiden voyage to Portland Harbor. 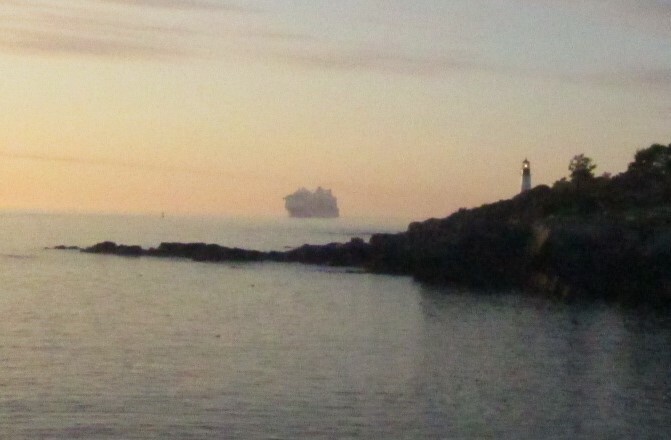 The ship sits 200 feet above sea level, with Portland Headlight's height capping out at 100 feet. 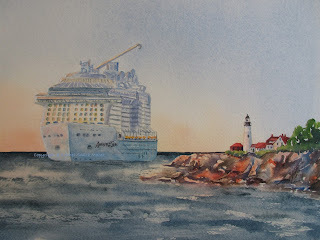 Whereas the ship had never come to port, I had to use my imagination to capture her arrival on canvas. I was fortunate to watch the ship's arrival at dawn this morning. The sunrise was amazing! 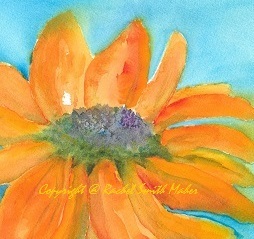 Orange and bright...a perfect Maine summer morning! This photo is quite grainy, but it captures the essence of the passage. Here she is heading toward the Ocean Gateway terminal, with Fort Gorges on the horizon. One more view...this from 310 feet above water. The North Star viewing pod was a real hilight of the day. Our tour graciously included a trip high above the city. This photo looks back toward Portland Headlight. It was such a special day: touring the ship, meeting the Captain, Hotel Manager, Cruise Director, and all the staff members. I am truly blessed to be able to share my artwork in this way. So special, it needs its own website. way to develop resilience in times of crises. We all need a new perspective on life sometimes, don't we? 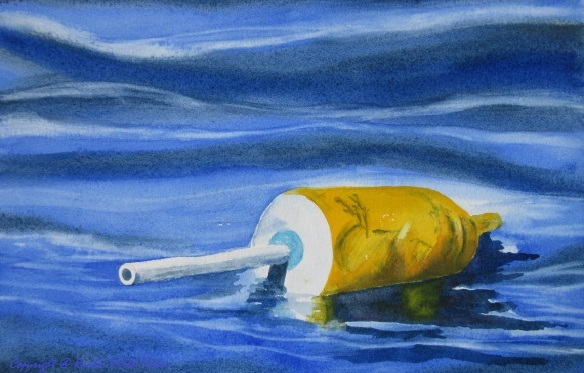 Click on the link...view my latest body of work...consider the message...share your thoughts. Grateful, always, for those who follow my journey. Photo of the local hummingbird from last summer. 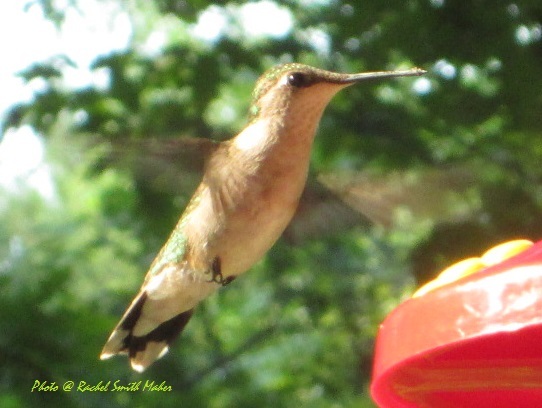 I love the shadow of her wings on her body. Soon I will capture it on canvas. As we set up the board, I reached for the brightest Trivial Pursuit game piece. My opponent commented, "Yellow! That's a healing color!" That statement pops into my head more often than not when my mind has focused on the color yellow, even though more than a quarter century has passed since we played that game one Sunday afternoon. 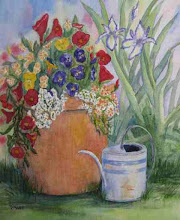 Sunflower, Daffodil, Pansy, Crocus, Black-Eyed Susan, Daylily, Coreopsis, Tansy, Buttercup. Just thinking about the essence of yellow, and all its alternative names, brings daylight to my soul. Science has studied the effect of color on moods, even appetites. 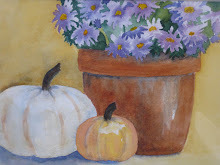 I'm drawn to golden yellow as fall turns into winter and the Sunflowers in my garden droop their seed-laden heads. 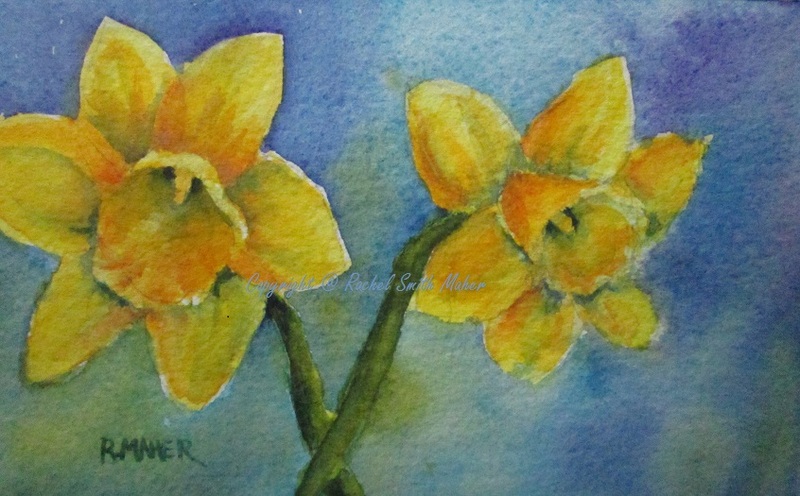 I tend toward bright yellow in the dark days of winter. I'm enchanted by the lemon yellow crocus blooming in the earliest of spring mornings, as I think toward the sunshine-filled days of summer. There is Light in the color yellow. Can you see it? Sneak Peek of The 29 Pears Project! 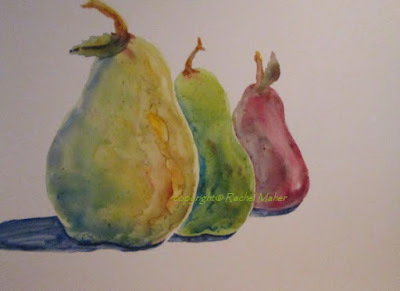 Celebrating pears! Here are a few samples of the little original watercolors I'm painting each day for the 29 days of February. Matted to 5"x7", each will be sold for $29 to anyone who wants to join in the fun! 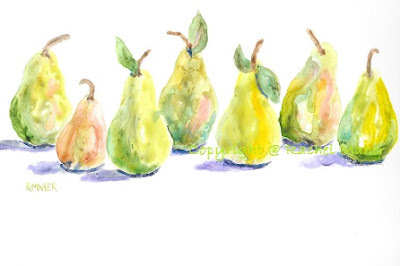 Introducing the 29 Pears Project! For the 29 days of February, I'll be creating 29 pear paintings, each to be sold for $29. This special offer works this way: If you're interested in purchasing one of these original, 5"x7", matted, unframed pear paintings, send me a message, or comment below. 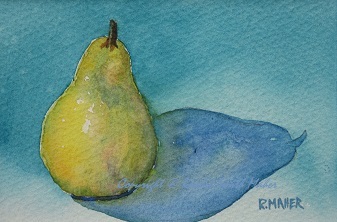 The first person to make a request and send payment will receive pear painting #1. 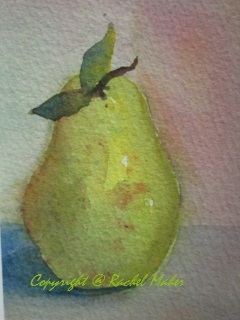 Second person will receive pear painting #2, and so on. 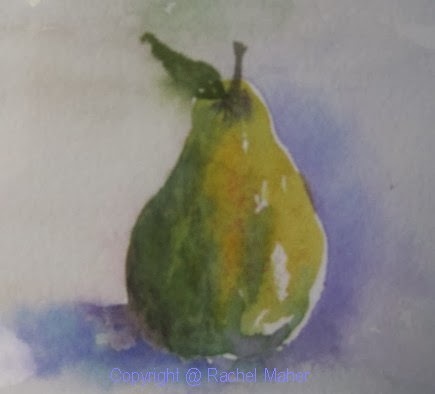 Although you won't be able to see the painting prior to purchase, you can be assured that it will delight the viewer and, obviously, be on the subject of pears! The $29 purchase price includes all tax and shipping. I will post sample photos every few days. 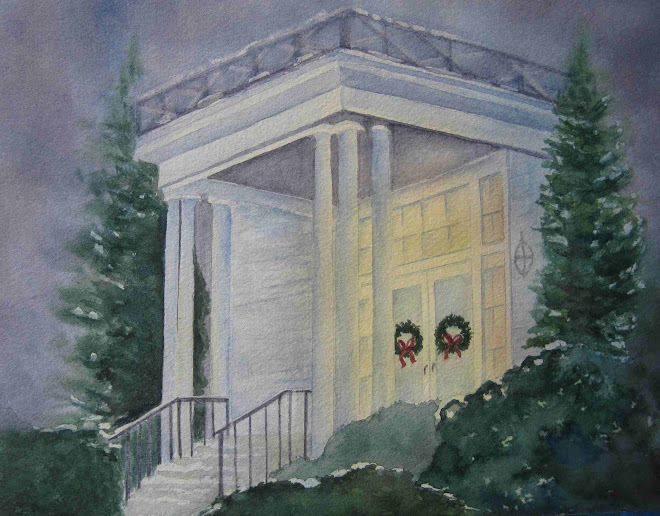 It is a fabulous way to own an original watercolor...or give as a gift! I am ever grateful for all who follow me on my artistic journey! Thanks so much! 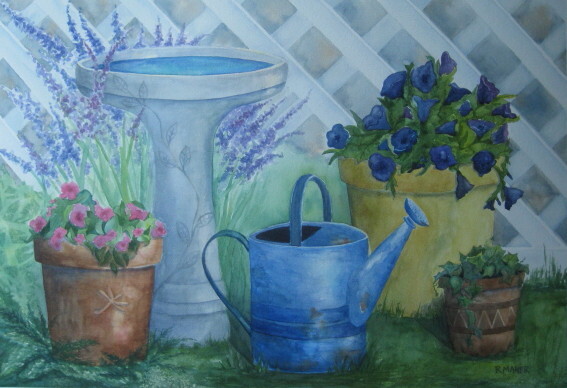 Plan to visit Skillin's Greenhouses in Falmouth ME to see this new art show beginning Jan. 21st through Feb 17th. Four wonderfully talented artists, and myself, will be displaying our watercolors, oils, and acrylics that represent our passion for color! 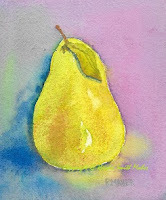 New Year, new pear painting! 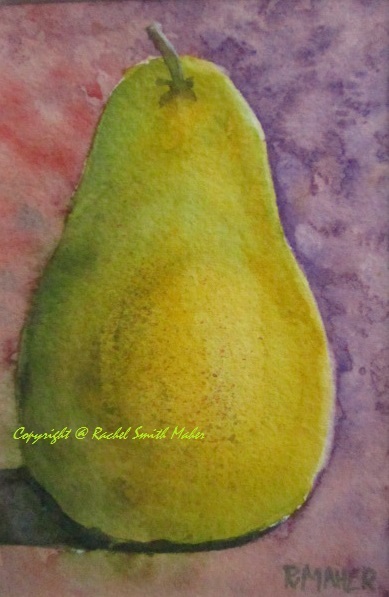 Each time I paint a pear, it is the same, yet oh so different. Kinda like the years we see going by in life...many similarities: each has the same 365 days, the same seasons, holidays, birthdays, etc. Yet each year brings an opportunity to do good, do better, and reach for the best. And with the dawn of each day in this New Year, God's mercies refresh us anew. And as always, I am grateful for those who are journeying along with me in my creative life! A special watercolor painted on a gallery-wrapped canvas over wooden stretcher bars...a fun new way for me to express my love of color and my home state of Maine! The grounds of this lighthouse in Port Clyde are fabulous to explore...grassy knolls, pebbled beach, rocky shore. Searching for sea glass is one of my favorite waterfront activities, and while hunting one day I turned to see the lighthouse from an unusual perspective. Because of its unique and inviting ramp, Marshall Point Light is most often seen from the vantage point of approaching the ramp. This side view allowed the lighthouse keeper's home to reflect the setting western sun, as well as the time-worn rocks that support its foundation. Perspective is an important skill to master. How does one learn it? More importantly, how does one master it? Framed in muted green wooden frames, with custom double matting. $400 each. I began this painting with my eyes closed. 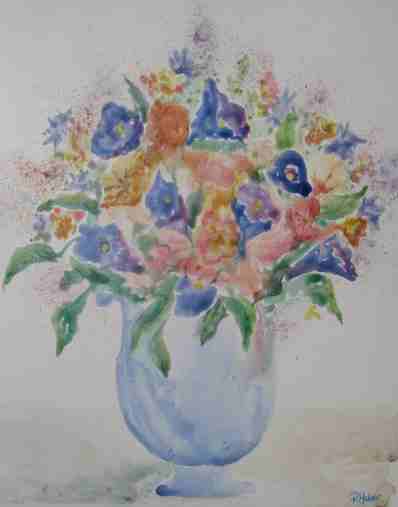 Brush in hand, blank canvas before me, the first few strokes of blue paint went on without the guidance of sight. The concept flowed from my spirit, through my brain, to my heart and out past my fingers holding the brush and onto the canvas. I knew I wanted to capture the delicate edge of a butterfly wing. I knew I wanted to use blue paint. Beyond that, this painting simply emerged, one brushstroke at a time. 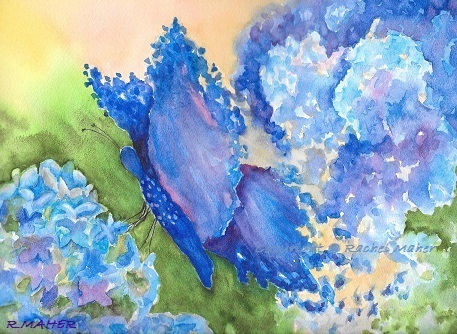 The butterfly wings give an element of uplift and perspective. While the hydrangeas were being formed, I felt a supernatural kind of connection to creativity itself. When the falling petals in the lower right corner showed up, I began to think upon the legacy we leave when we leave this earth. Then I felt the spirit of Cassidy Charette with me as I completed this piece...as it transformed from the message I had hoped to communicate to Cass's message: Leave a legacy of Light. Taken from her friends and family at such a tender age, Cass nevertheless has impacted all who knew her...and even many who did not. Her generous spirit lives on through the replication of her actions while she was still with us. Treasures stored up in Heaven. Our many material trappings bring contentment and comfort on a physical level...but consider what non-material gifts we can bestow upon our circle of people...love, compassion, a helping hand. Time is short my friends. In the Holy Bible we are taught to number our days. Make this day count in the life of those whose path you cross. ~~~Shine on, Cass! Meet "Red", our resident Cardinal. This painting was inspired by a photograph I took of him finding food for his young 'uns this Spring. I discovered that the male cardinal feeds the hatchlings while the mama cardinal moves on to build a new nest for the next brood. He's tilting his head to listen for worms. Can you imagine having to listen to a worm crawl to get fed? How quiet you would have to get to allow that to happen. Quiet in the mind, heart, and soul. And if you took the opportunity to get THAT quiet, what would you hear? Phew! 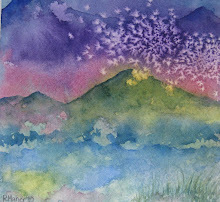 For a while there I wasn't sure if my creative spirit would emerge from a season of storms and discouragement. Sure, I painted a few pieces, finished a couple others...but honestly it was a mechanical process...without connection to my inner artist. Today, however, I entered my studio filled with both inspiration and motivation! And voila! 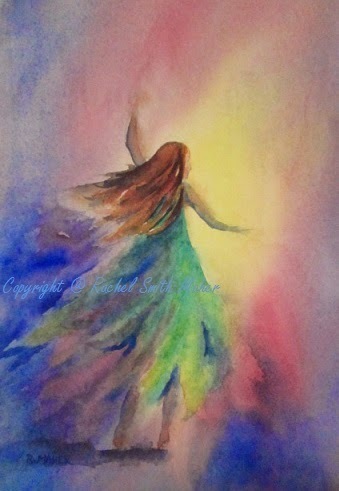 This beautiful dancer emerged from the end of my pencil, encouraged by the colors on my brush. She's Dancing to the Light. Ever wonder why some things happen?? Like, when you show up somewhere, and wonder why you're there? That happened to me yesterday. I had the opportunity to connect with an old friend and watch her daughter dance in a competition. While the conversation was wonderful, and the dancing amazing...more than once I asked myself what I was doing there. I've never watched a dance competition before. I asked myself, "wouldn't you rather be watching March Madness, cozy at home...". The answer soon became: "You're supposed to be here!" The inventive dance moves, the bright costumes, the music...all fed my creative spirit. I found myself reminded that a tu-tu does in fact resemble an up-side-down poppy. A nudge by my friend suggesting I should paint a dancer pushed me forward. And so, I am grateful...that my friend agreed to meet me...that her daughter decided to pursue her passion for dance. But most especially that by simply "showing up" one can influence another in ways that may never be known. Isn't that cool? Five years ago a young mother passed away from a terrible blood cancer. Her friends and neighbors loved her so much they wanted to honor her memory in some quiet way. They approached her widower to inquire about how best to accomplish their mission and ask his blessing. He recalled how compassionate the nurses and staff at the hospital had been toward him and his 6 year old son. “Something that reminds them of Liesel, her journey, and how they helped us through” was his best suggestion. “Maybe a painting to hang at the hospital that was Liesel’s ‘home’ for so many months”, he offered. The neighbors went away puzzled, as they were not personally familiar with any artists, nor did they think they could raise the funds to purchase such a memorial. However, they prayed, and trusted that if it was meant to be, it would come about. And it did. The daughter of one of the neighbors had a friend who was just getting started on her own journey of sharing her artwork as a way of sharing her faith, while simultaneously coming to terms with her own blood cancer. It would be a wonderful, well-timed opportunity to debut her original work at a corporate level. It became less about the cost of the painting, and more about bringing beauty and peace to a wing of the hospital that often lacked both. Connections were made. Telephone calls went back and forth. Review and approval of the artist’s work had to be made through corporate channels. A week later, it was a go. The time came to select a piece of artwork. The neighbors approached the widower and his young son again, asking for their selection of what would be displayed in memory of their wife and mother. They viewed the artist’s paintings. 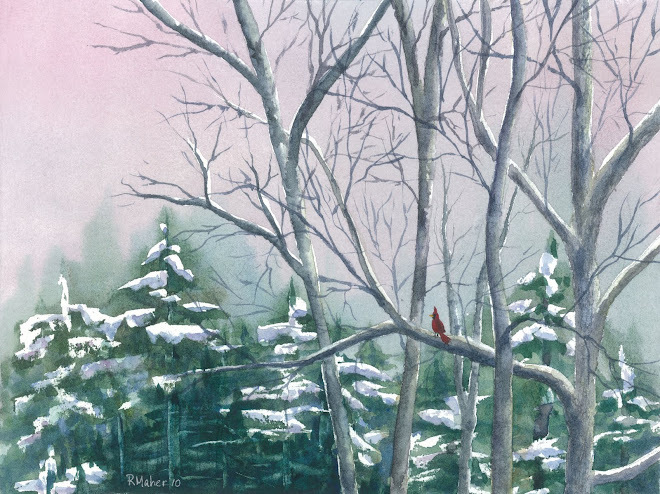 The boy was drawn to the red bird in the snow-covered trees. It reminded him of the love from his mother. And so it was. The art was purchased by the neighbors and delivered to the hospital. This story’s value is in how the community came together for a young family…the medical community, the neighbors, the friends. But the collateral benefit impacted the artist as well. Many people were involved in the process, each offering encouragement and praise for the humble beginnings of a path toward creativity. This generous spirit wove its way through the entire process. The thread of hope and love tied it all together. This is also my story. The artist was me. 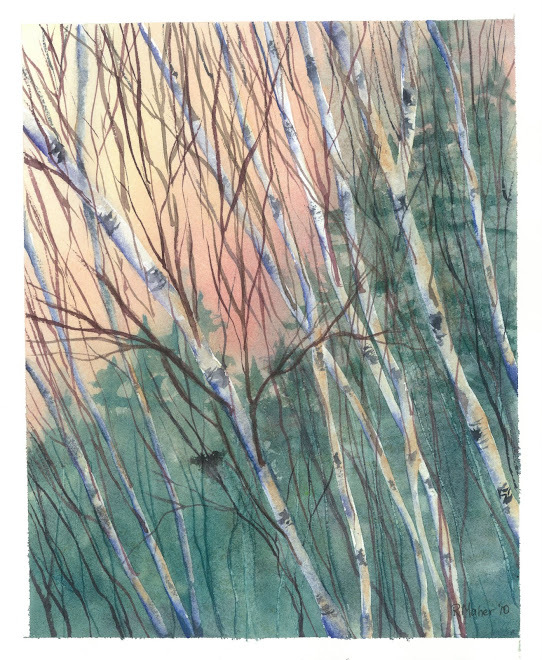 The watercolor "Treetops in Winter" hangs to this day, on the 5th floor of Maine Medical Center, known as the Gibson Pavilion. 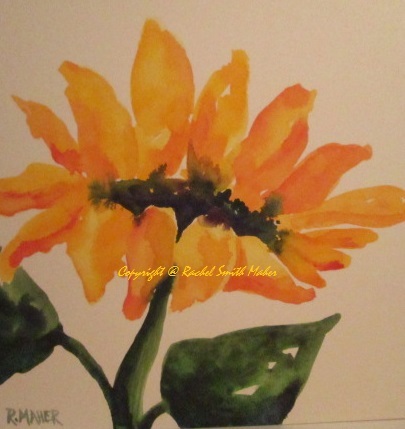 Sunflowers have inspired me lately...as they do every fall. Attempting to capture the fluidity and flexibility of the petals this year. Still a work in progress, but my creative spirit is engaged and working! Going with the flow...reducing expectations...breathing in and out...simple things, but they make the days just a bit easier. Someone once said, "When you're pressed, what's inside comes out". I see this evidenced in my life. I have been pressed on every side this summer...beyond what anyone should need to bear...and here's what emerges from my soul: This painting is a result of showing up at my easel, putting brush to paper without prior conceptualization or thought, and seeing what happens. What comes out. The painting is meant to be open to interpretation...every viewer brings to the event their own feelings, imagination, eyes. I see storm clouds...but they're moving. 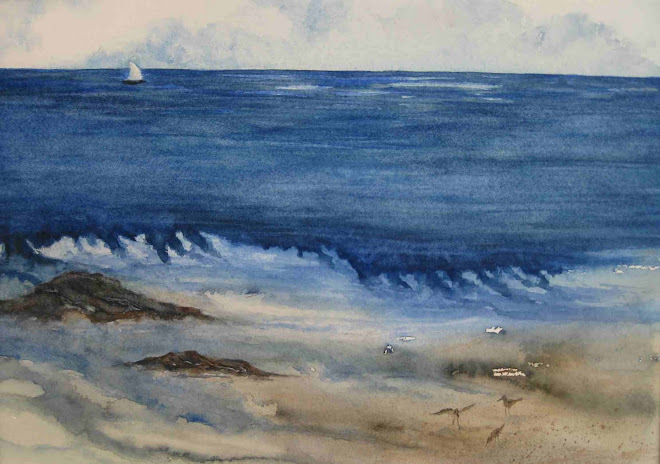 I see rough seas becoming calm as they reach the shore. I see land, dark and distant, but an opening--a cove--for safe approach. I see reflections...mirrors to the moment. I see light...bright and glowing light...that remains constant despite the storm's attempt to obscure and cover. That's what is inside me...an ever present knowing that Light is within reach, just beyond the darkness, just beyond the storm. The painting, "Megan Jill", is a commissioned piece from 2009. 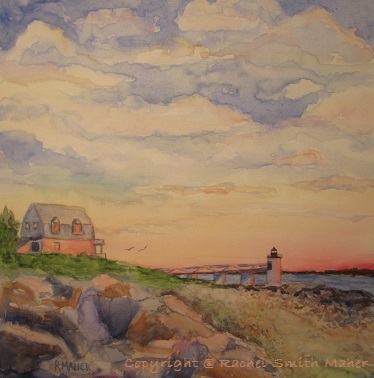 It was to depict not only the boat, whose namesake would be the recipient of the artwork, but also the quaint Maine village of Friendship Harbor. Several of the wharves and buildings were owned by the same family as the lobster boat. 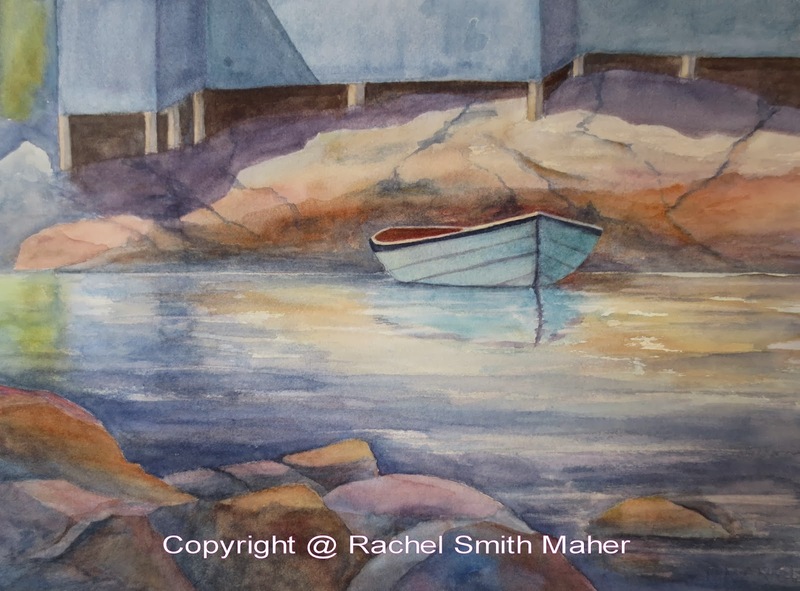 I took on the project, using a photograph as a reference, as I had never been to Friendship, Maine. Fast forward to 2013...while on an trip up the coast of Maine, my friend suggested we visit the coastline north of Damariscotta. We headed toward Friendship Harbor and I became excited to see it firsthand! As we drove down the narrow, curved pavement (upper right portion of the painting) and onto the wharf and I felt like I was back in time. Back to the days when I was sketching and painting the piece. I recognized all the buildings, the bait shacks, the peaks of the houses...it was surreal and fascinating to this artist's brain! Of course, I wanted to find the Megan Jill! So I explored each corner...but came up empty. Walking down the last pier, one boat caught my eye, the Jill Marie, as I strolled past it. But it was not the same color, so I kept moving. When I came back from the end of the pier, I read the words "Jehovah Jireh" painted on the side of the Jill Marie. I hadn't noticed them the first time I walked by! Translated, this means "The God Who Heals". Tears began to fall from my eyes. I knew it was God speaking to my heart. Telling me I am on the right path. For back in 2009 I was diagnosed with a troubling illness within a few days of quitting my job and pursuing this artistic journey full time. 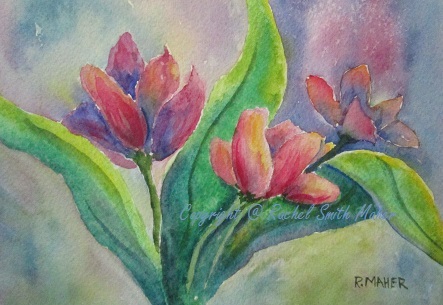 As I worked my way through the emotional roller coaster ride that accompanies any serious diagnosis, painting kept me grounded in the present moment. 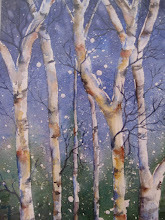 Painting was, and continues to be, a tremendous instrument in my day to day peace. Through the miracle of prayer (mine and those of my precious friends) I have continued to paint full time for nearly 5 years now. It is my dream come true. Being able to express myself through watercolor painting has truly brought great healing, to my soul, and subsequently to my body. I am grateful beyond words to my God and the special people in my life who lend loving support and encouragement to me as I walk this amazing walk called the journey of life! Friendship...the name of the place...and the name of so much more! If we fail to pause, even for a moment, to bear witness to nature, why are we here? 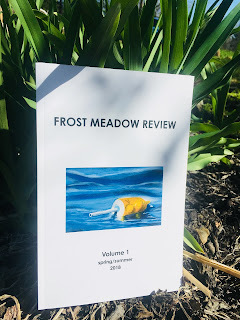 Beyond cars and concrete and cappuccinos is a world that quietly marks the passing of time through light and tracks and new birth...melting snow, green buds, singing birds. To every thing there is a season, and a time to every purpose under Heaven. 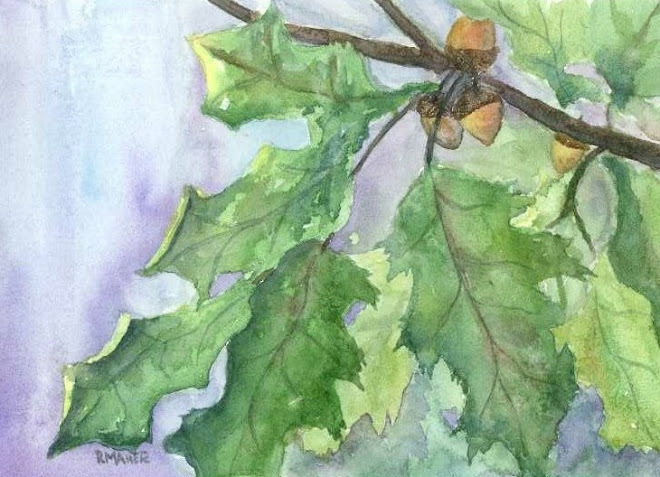 This painting is of a large pine tree that sits on the edge of our property line. I look out upon it as I sip my morning coffee. And in certain seasons, the morning light illuminates the base of the trunk and lower branches. It has always captured my attention--enchanting me with thoughts of how light can make its way through a thicket to warm up the snowy forest floor. Today, as I was silently watching through my window, a deer made its way behind the tree and rested just to the right of the trunk, nestled in the snow, taking a moment to her self. Made me wonder if she would farrow early and bring forth an spotted spring fawn, but after a while was joined by others in her herd and they moved on. It is precious and sweet to gaze upon the creatures of the woods. We must take time. Twelve Noon on New Year's Day. Happy 2014! I absolutely love New Year's Day...its a new beginning, a fresh start. Its a chance to grow, learn, change, appreciate, and love...just a little bit better, a little bit more, than the year before. Building upon all that I learned, I journey forward into this budding pathway. I have some new things I want to try, some new thoughts I want to think. Join me in this voyage we call life...the adventure of a brand new year! 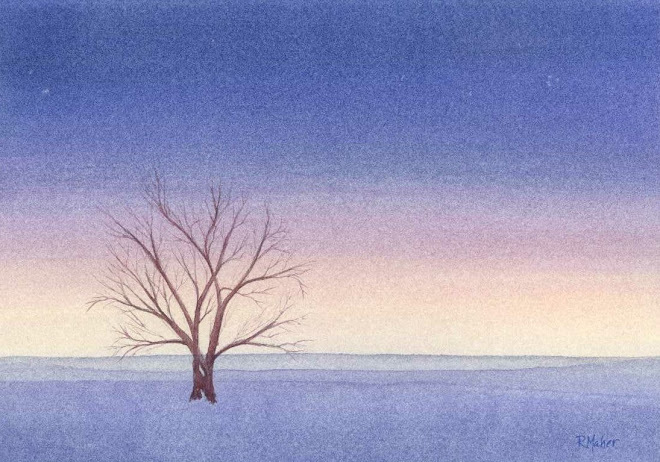 Dan Fogelberg's most famous Christmas song is Auld Lang Syne, of course. "Saw an old lover in the grocery store...la da da da Christmas Eve..." But he breathes new life into this 19th Century Christmas hymn and it has become one of my all time favorites. You can find it on his "The First Christmas Morning" CD--highly recommended--as a collection of beautifully written or resurrected pieces that point to Christ, the whole reason for Christmas. Enjoy! Words: Christina Rossetti, 1872. Music: Gustav Holst, 1906. Maine's coastline is as variable as the weather...rocky here, sandy there...smooth sailing one day, storm front moving in the next. Hearty beach roses are among the flora and fauna that frame the sea, their beauty showing forth despite salty air and challenging conditions for growth. I love sitting on the rocks watching the waves crash and the seagulls diving for dinner. Sometimes a lobsterman cruises by, stopping to check his pots next to the colorful buoys. Capturing the tides on canvas, the ebb and the flow, reminds me to remain flexible and moving, growing and loving every day. It's been a while! Summer morphed right into fall before I could even catch my breath! I have missed writing and posting here...and look forward to a bit more activity in the coming months! Life has been incredibly busy, but oh so very good. 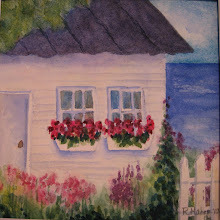 I relish the sweet moments time has given me...now tucked away as fond memories of family, fun, and fulfillment of my dreams through painting. God is good, all the time, and all the time, God is good! Spring flew right past me this year! All of a sudden it's June and I haven't posted on my blog in a long time! I had a little fun with acrylics a few weeks ago. 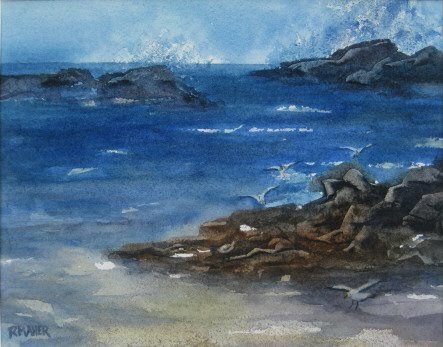 They are the opposite of watercolors in technique, but one can still achieve a similar "watery" effect. 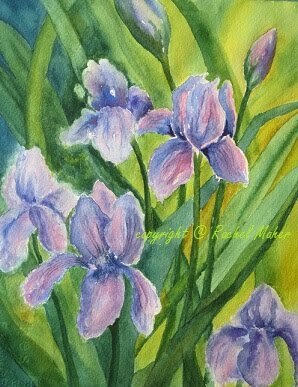 I named this painting "Hope" because Spring always brings with it a promise of hope...the cold winter melts into greens and purples and pinks...the quiet snowflakes give way to chittering, chattering birds...the frosty air turns fragrant and warm. It's not that Spring went by without my noticing...it's just that I was busy marking time in Nature, not online! The violets carpeted my lawn, the daffodils laughed in the breeze, the tulips smiled before each faded petal fell, the lilacs and honeysuckle scented the garden then gave way to the irises and lupines. And so it goes...and so it goes. God's mercies are new every morning...He brings forth the flowers and the rain...the sun and the moon...each in its own time. 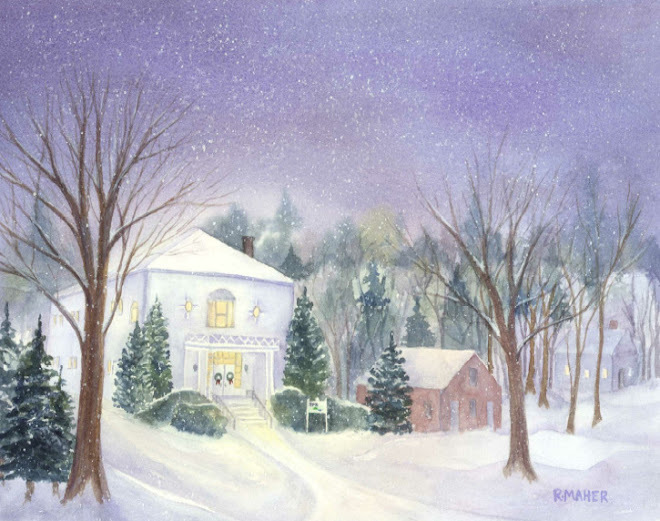 This painting is in a private collection in Maine. Crystal blue skies and daisies in the field. All is well at the farm. A quintessential summer day. Farmers love these kinds of days, because so much work can be fit in between sunup and sundown without obstacles like mud or cold. But farmers have a lot to teach us about how to live out our lives. Sunny days are great--but rainy days are just as important when growing a crop. Seeds are planted along with the faith that rains will come to soften the shell so new growth can emerge. Faith that after the rain, the sun will warm the soil so roots can reach deeper still, enjoying the nutrients found in the layers found beneath the surface. The faith of a farmer--simple, elegant, and rich. "Speak, my heart listens; guide, I will follow"
Four new tubes of paint + one new brush = a happy day of painting! New Year's greetings a few days late...but better late than never. 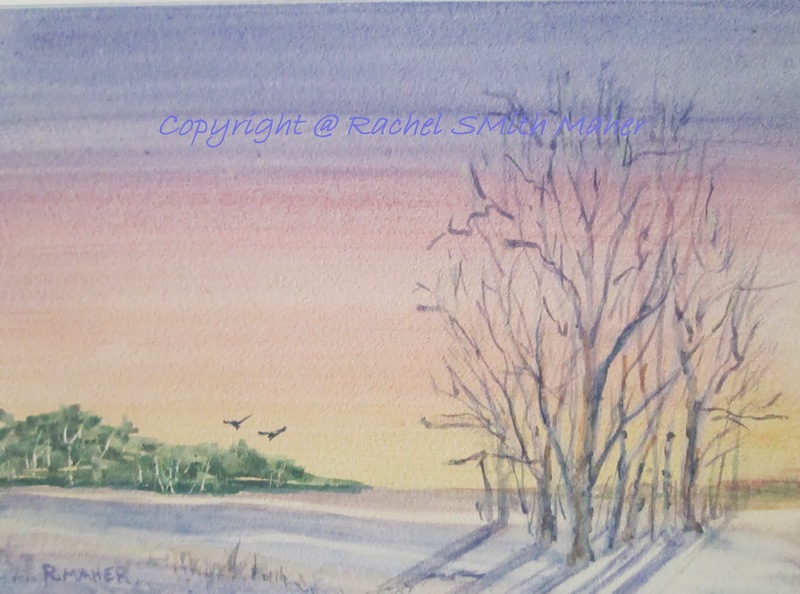 In this sunset painting, I was inspired by the dark tree shadows contrasting against the pink/orange glow of the setting sun on the snow. Just beautiful! 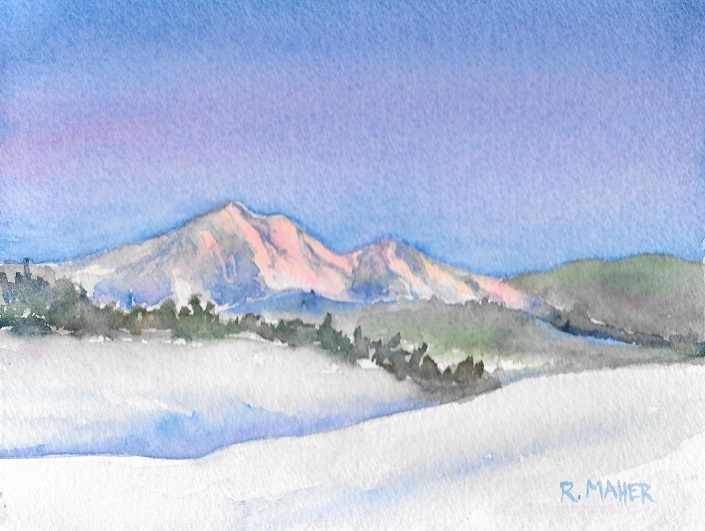 A new year means a fresh start, new goals, new fun--and many new paintings! I am pleased to be back in my studio after a holiday break, connected to my passion, and ready to see what 2013 brings! I am grateful to my Lord who has provided this opportunity, and promise to steward it carefully! And, as is tradition at Dragonfly Arts, the first painting of the year is available for free to the first person who asks for it! This scripture says it all...so my words will be few: "Fear not!" the angel of the Lord said unto the shepards. So easy in concept...yet at times so difficult in action when following the path God has chosen in faithful obedience. Love casts out all fear...if we love enough, if we allow God's love to be enough, the fear will abate. The fruits will be recognized as joy and peace. Merry Christmas my friends! 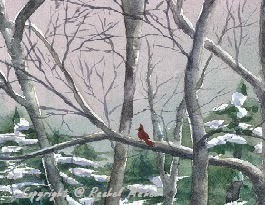 ~~~This painting is in a private collection in Maine. This time of year, when the skies are mackerel-striped gray, I tend to reflect back on the past 11 months...what I've done, what worked and what didn't, fun times, hard times, and sunny days. 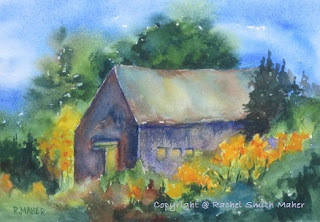 Last June, some artist friends and I travelled to Coastal Maine Botanical Gardens to paint en plein aire. When we were about to leave, I snapped this shot of the sun glowing behind the petals of the water lily. Couldn't help but be inspired to paint it! In 2012 I spent more time painting and teaching watercolor painting than ever...had more shows and exhibits than ever, and was able to reach out to more people than ever with my message of Light and Hope. Being able to paint is so special to me...not necessarily the talent, but the opportunity: spending time and creative energy to put brush to paper...to be able to impact the viewer...in my case, I hope to bring peace to the heart of the beholder. As I put my trust in Christ, my Creator...I hope to continue this journey receiving each day, one by one, as the gift that it is. Early September morning in Vermont...fishing on a little river up North. It was one of those magical mornings where the sun hit the edge of the leaves to make them glow and glitter...with the water glistening as it rippled along. A gift from God just for me. 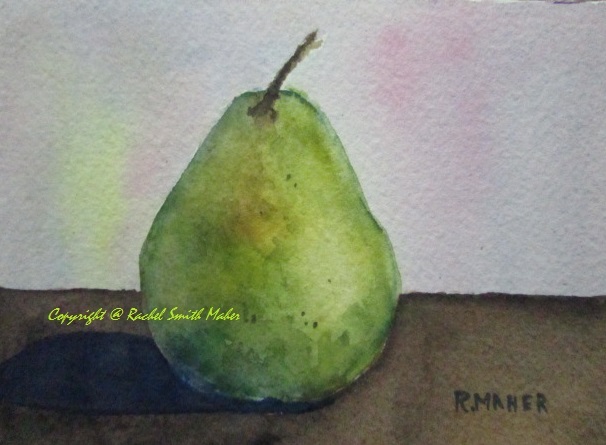 I painted this scene while sitting on a rock...my foray into Plein Aire painting is producing decent fruit. In the middle of it all, I was overcome with pure joy...I felt so happy...like I was resting peacefully right in the palm of His hand. The safest place for me to be. Right where I'm supposed to be. 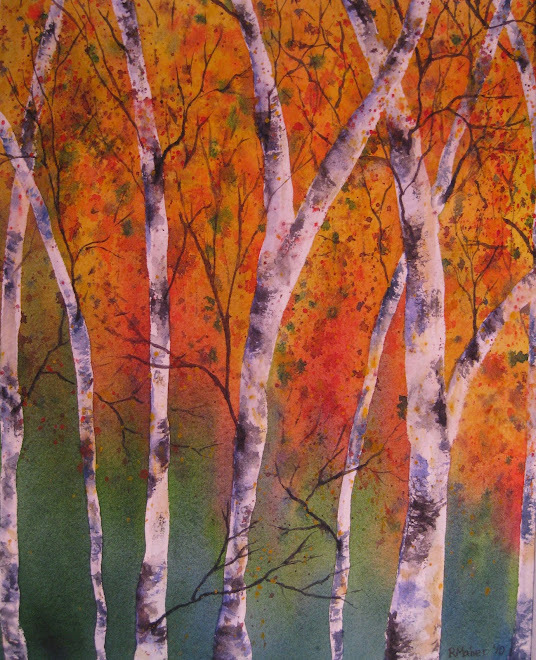 ~~~This painting is in a private collection in Maine~~Giclee prints available: Image size 10"x8" $60 unmatted/unframed. Don't ever be afraid to try to make things better: you might be suprised at the results. Don't ever forget that achievement isn't as hard as it seems. Don't ever stop loving, don't ever stop believing, don't ever stop dreaming your dreams. Giclee Prints~~what are they? How do I order one? Giclee prints are the highest quality, closest-to-the-original, reproduction print available with today's digital technology. 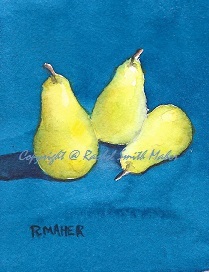 They are printed with archival ink on the same watercolor paper that I use to paint the originals. Want a closer look? 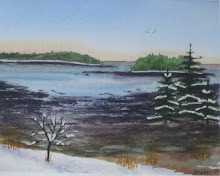 Email me at dragonflyartsofmaine@yahoo.com and I'll send you a bigger image. Interested in purchasing a print? Email me! Interested in purchasing a watercolor? 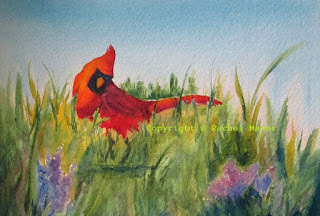 My mission each time I pick up my brush is to interpret and reflect God’s Creation. I wish to bring a sense of peace to the heart of the beholder. 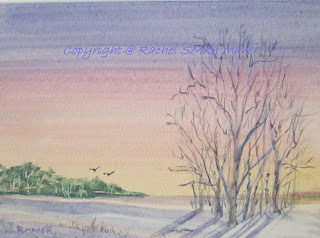 I am amazed and inspired by trees in winter, blaze orange sunsets, and the deep purples and greens in my flower garden. 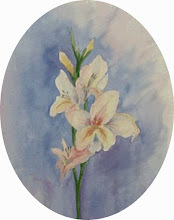 I have been painting and creating since a very young age. Although I am primarily self-taught, I have had some special teachers along the way, guiding and helping refine my technique. I am grateful. Commissions are welcomed! I love to work with clients who have an idea or an image to bring that concept forth onto canvas! It's a wonderfully rewarding experience! Contact me at dragonflyartsofmaine@yahoo.com for details! Coming up with the name "Dragonfly Arts of Maine" was quite simple, really. I just had to stop thinking for a moment and notice what has happening around me. I was sitting by my pond, staring at a blank piece of paper, when a lovely dragonfly landed right on the page in front of me. "Hmm...maybe 'Dragonfly Arts of Maine'!" I said to myself. The dragonfly nodded his head in agreement. 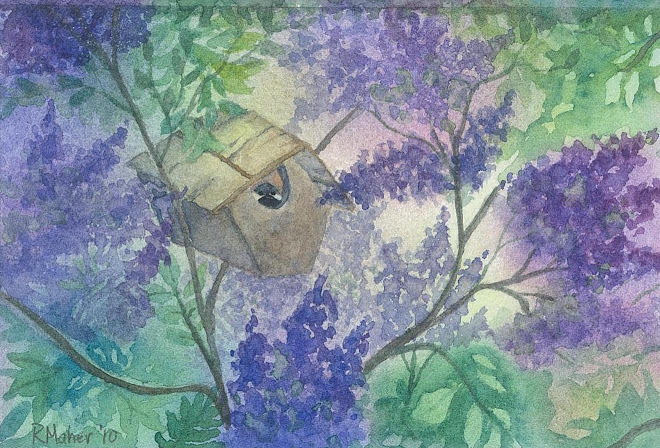 Be sure to visit my older posts by scrolling to the bottom of this page of posts and click on "Older Posts"...see firsthand my journey of a lifetime as a watercolor artist! The colage of paintings below are a representation of those which have found new homes across Maine, the United States, and Canada. All images in this blog are protected by copyright and may not be reproduced without permission.. Theme images by TommyIX. Powered by Blogger.